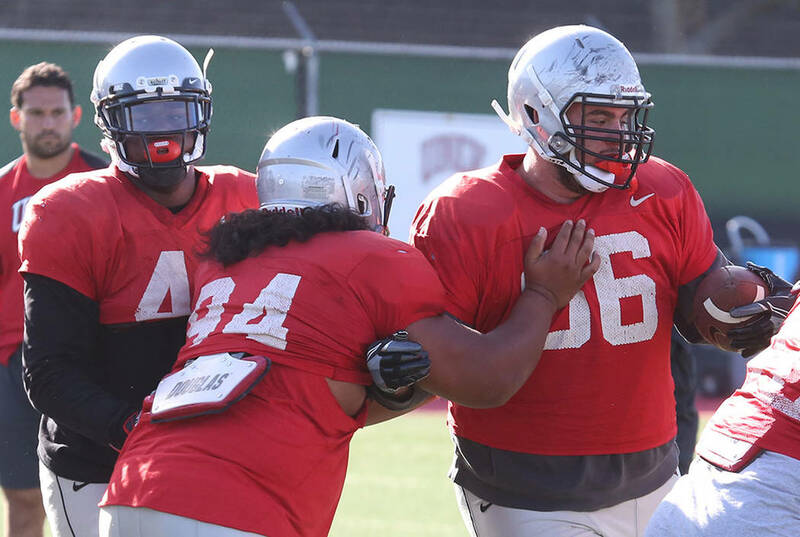 UNLV surprised senior defensive lineman Ammir Aziz with a scholarship, bringing a roar from his teammates after practice. The Rebels play their spring game on Saturday at Peter Johann Memorial Field. — Senior defensive lineman Ammir Aziz, who went to Durango High School, received the surprise after practice of a full scholarship. UNLV brought in Farrell Dillon, who performs in the “Masters of Illusion” show at Bally’s, to involve Aziz in an act in which Dillon had to get out of a straight jacket while balancing on a skateboard over a cylinder. After Dillon freed himself, he asked Aziz to remove an envelope attached to performer’s chest. Aziz read the news of the scholarship and yelled, “No way!” He then was mobbed by his roaring teammates. He said he has worked as an overnight security guard for the MGM Grand, and would get off his shift and arrive at campus in time for the 7 a.m. team meeting. Aziz would stand to make sure he was awake and alert. — UNLV will have its spring game at noon Saturday at Peter Johann Memorial Field. There will be two 25-minute halves. The starters will face each other in the first half and go against the backups in the second portion. More Rebels: Follow all of our UNLV coverage online at reviewjournal.com/Rebels and @RJRebels on Twitter.